South Creake01485 532610work VillageSouth Creake, tucked into the valley of the little river Burn is about 15 miles east of Hunstanton and 6 miles north of Fakenham. Its heart is the Green and playing field beside the river and the B1355 road which runs towards the coast, about 6 miles distant. At the heart of the village is The Plume of Feathers public house. 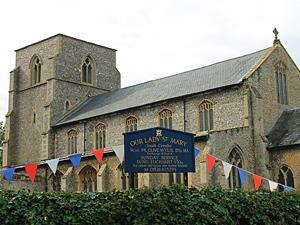 The large mediaeval church of Our Lady St Mary, loved by Sir John Betjeman among others, is a sign of the earlier wealth and size of the village. The church was largely re-built in the 15th century and features a stunning angel roof restored in the 1950’s. Other hints of the past include the Iron Age fort on Bloodgate Hill and the tiny Saxon church at Waterden. The village is also home to The Yorke Trust, founded in 1985 to promote the arts and particularly music among young people and more recently, since around 2005 it has been home to the North Norfolk Music Festival which presents concerts by international musicians in the church of Our Lady St Mary over a period of approximately 10 days in late August and early September. South Creake, tucked into the valley of the little river Burn is about 15 miles east of Hunstanton and 6 miles north of Fakenham. Its heart is the Green and playing field beside the river and the B1355 road which runs towards the coast, about 6 miles distant. At the heart of the village is The Plume of Feathers public house. Along with neighbouring North Creake nearby, the village is well located for exploring the beautiful Norfolk countryside and coastline nearby.